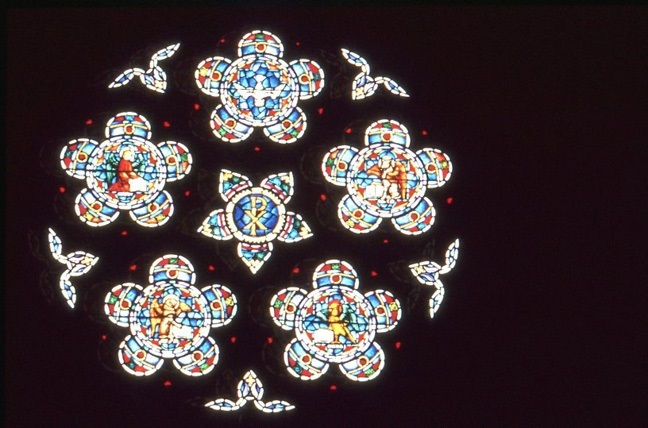 Brief Description of Subject: Rose Window, made of center medallion and five surrounding ones, each five-pointed. Also some tracery. Center features Chi-rho. Top medallion shows Holy Spirit in form of Dove. Clockwise from here: Winged ox with book, symbol of St. Luke. Eagle with book, St. John. Winged lion with book, St. Matthew. Winged man with book, St. Matthew. Made of a total of 1,500 pieces of glass. Made by George Payne Studios, of Mfctr [sic. for Manufacturer? ], England. All church windows installed by Bela Britok, of Detroit, MI.